Chemical bodybuilders who accidentally inject their anabolic steroids into a blood vessel instead of muscle can develop temporary problems in their respiratory system. They become short of breath and may even cough up blood. Usually you notice it immediately if you inject wrongly, but sometimes it takes longer for the effect to be felt. 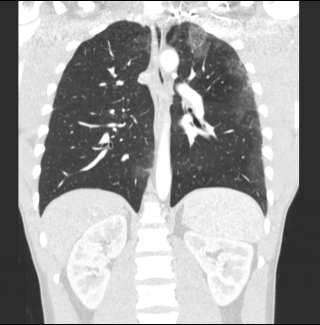 Danish doctors described two cases in the medical trade journal Respiratory Medicine Case Reports. The first case the Danes described was a 29-year-old bodybuilder. He went to Accidents and Emergencies at the hospital as he'd been short of breath for five days and had been coughing blood. He had started a course of anabolic steroids six weeks before. He was taking 60 mg methandienone and injecting 16 units of rapid-acting insulin daily. In addition he was injecting 1g testosterone and an unknown quantity of nandrolone every week. When the doctors examined him they found nothing abnormal initially. Granted, the guy had miniscule testicles, but that's to be expected from taking steroids. They tested his blood, including the blood he had coughed up, but found no pathogens or sign of inflammation or an allergic reaction. The doctors made a high resolution computed tomography scan [a sophisticated X-ray] of the man's lungs and saw haemorrhages everywhere. They are the white patches in the figure below. The doctors assumed that the haemorrhages were the result of the injections of testosterone or nandrolone that the man had given himself. The steroids are dissolved in oil and have to be injected into muscle tissue. If the injected material enters the bloodstream by mistake, then oil can get into the lungs. And there the oil droplets cause bleeding to take place. When the Danes searched the literature for more information, they found an article published in 2011 by researchers at the university of Calgary in Canada. [Can Respir J. 2011 Jul-Aug;18(4):e59-e61.] It described a 21-year-old bodybuilder who injected steroids into a blood vessel and almost immediately developed feelings of suffocation and short breath. Haemorrhages started to develop in his lungs. The Canadian decided not to intervene and to wait. In the two days after the symptoms gradually disappeared, and a week after a 'wrong' injection the Canadians detected no more haemorrhages on scans. The Danes decided to use the same approach. They asked the bodybuilder to stop using steroids and saw that he longer coughed up blood and his short breath disappeared. When a scan was done a few months later, there were no more haemorrhages any more. The first case the Danes described was a 19-year-old bodybuilder. He'd been using steroids since he was sixteen, but two weeks before he started coughing up blood and feeling breathless, he had started the heaviest course of steroids he’d ever tried. He was taking oxymetholone and methandriol [well - according to the article...], and injected trenbolone and nandrolone. 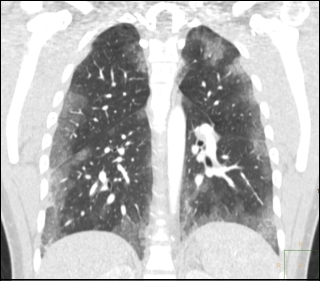 The result - as far as his lungs went - is shown below. The doctors asked the bodybuilder to stop and the symptoms disappeared spontaneously. A few months later the scans showed that the lungs were functioning normally again. "In both cases the patients' symptoms slowly progressed over days/weeks and there was no information about possible accidental intravenous administration of the steroid solutions", the Danes wrote. "Neither of the patients reported symptom onset directly related to the time of injection." "Our cases illustrate the importance of raising awareness of the acute and possibly life-threatening adverse effects of anabolic steroid abuse. In the case of high resolution computed tomography, findings with predominantly ground glass opacity primarily in the peripheral regions in an extremely athletic patient, suspicion of anabolic agents induced diffuse alveolar hemorrhage should be considered." "If diffuse alveolar hemorrhage is suspected, bronchoscopy should be performed immediately to establish. The diagnosis and withdrawal of the suspected drug is crucial." Respir Med Case Rep. 2016 Apr 13;18:45-7.